The Dutch newspaper Trouw made waves last month with an exposé of the "Shari'a Triangle," a heavily Muslim section of The Hague's Schilderswijk district where "short skirts and dresses are not accepted on the street" and people have been harassed for smoking, drinking alcohol, and owning dogs. Despite the journalist's lengthy investigation, many officials have dismissed concerns that Islam dominates the zone. Hasan Küçük, a municipal councilor from the Islam Democrats party, brushed off the claims as rightist propaganda while adding that "there is nothing more natural than seeing a covered woman or a man with a beard in the streets or a mosque being constructed." Trouw has a less sanguine view: a "small caliphate" is blossoming. Another article notes that the historic Van Ostade Jewish Housing Project "is surrounded by the Schilderswijk neighborhood." Tensions prompt some of its residents to hide symbols of faith such as yarmulkes. A separate report focuses on Schilderswijk's Christian-affiliated Paul Kruger School, which recently shelved plans to install an exterior plaque commemorating the Holocaust due to fears of vandalism. Nor could a poster for a Holocaust event at Kruger be put outside. The area, a spokesman explained, "is not a peaceful place." While pundits theorize about Europe's fate amid demographic changes, enclaves like the one in Schilderswijk already ring alarm bells. Left: "This is Holland. Shari'a does not apply here," stated anti-Islam Dutch MP Geert Wilders during a visit to Schilderswijk in May. Right: Cell phone footage shows criminals in Islamic apparel fleeing Selfridges on Oxford Street, London, earlier this month. In one of the boldest examples of burqa banditry to date, six ax-wielding men in Islamic-style robes and face coverings (probably niqabs, not true burqas) conducted a smash-and-grab robbery at London's famous Selfridges department store on June 6, carting off £1 million in watches as customers looked on. Police caught one perpetrator and his accomplice when they crashed their getaway moped. Other suspects remain at large. "Fortunately robberies like this are rare," said Detective Chief Inspector Andy Noyes. Actually, niqab-aided crimes are rather common. Consider just the past few months: On June 2, two men and a woman with "a fake foreign accent and … a pink burqa covering her face" robbed a pharmacy in Perth, Australia. On April 19, "a man wearing a burqa covering his entire face except for his eyes" held up a liquor store in Bel Air, Maryland, before leading police on a car chase. 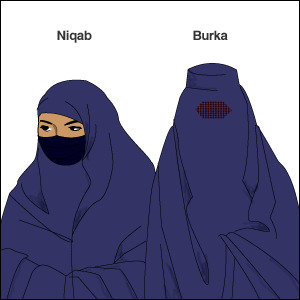 On March 13, two individuals in "burqas" were responsible for a bank heist in Lyon, France. One can debate potential remedies, such as bans on face-concealing attire, but the danger posed by extreme Muslim garb is beyond dispute. A week and a half after jihadists butchered Lee Rigby in Woolwich, London, Andrew Gilligan of the Telegraph thoroughly dismantled the backlash hype by analyzing the media-promoted figures issued by Tell Mama, a UK government-funded "Islamophobia"-monitoring project whose head, Fiyaz Mughal, was claiming "a wave of attacks … against Muslims." Of the 212 "anti-Muslim incidents" it had listed by June 1, Gilligan determined that roughly 120 were mere online postings. Mughal admitted that another 35 were unverified. Only 17 incidents "involved individuals being physically targeted. Six people had things thrown at them, said Mr. Mughal, and most of the other 11 cases were attempts to pull off the hijab or other items of Islamic dress." Gilligan found no confirmed instance of a Muslim needing medical attention. In short, Mughal's assertion that "the scale of the backlash is astounding" does not withstand serious scrutiny. Gilligan grasps the Islamists' game: "The narrative of British Muslims under attack, increasingly hated and feared by their fellow citizens, is essential for recruitment." Ignoring facts, they also "attempt to draw some of the sting from Islamist terrorism by equating it with the work of anti-Muslim extremist groups" — embellishing words and deeds that may be obnoxious but, as Bruce Bawer puts it, are "hardly in a league with decapitation." Left: It has since been revealed that the government will not renew Tell Mama's grant. The decision, made prior to Woolwich, was based on the project's shoddy data. Right: Fiyaz Mughal and Tell Mama have been accused of trying to silence their critics through legal threats. Halal's advances in the English-speaking world extend well beyond Britain's Shari'a-friendly shores. Consider Australia. An Arab News article declares that the country's "greatest export is a culinary one — the quality of its delicious halal meat." Yet much of that meat stays put to feed Aussie Muslims, whose numbers jumped by 40 percent between 2006 and 2011. Eateries are responding in the usual manner. The Daily Telegraph reports that "halal food is now sold at a dozen McDonald's restaurants and bacon is off the menu at some KFC outlets to accommodate the religious sensitivities of Australia's growing Muslim population." Most surprising is the incredible variety of products labeled as halal in Australia, including such ironic items as Cadbury Easter chocolates. The phenomenon is tracked online by activist Kirralie Smith, who notes that Muslim groups often pressure businesses into obtaining halal certification even for foods not requiring it under Islamic law. Smith documents more than 300 companies operating in Australia that comply: "Purina Fancy Feast cat food is now on the list of halal-certified foods. Are cats becoming Muslim? Or is a lot of this just a money-making scheme?"